How not to handle a nuke threat. This was the week Iran hawks had been waiting for. The Bush administration put a formal halt to the State Department’s flirtations with the Iranian Foreign Ministry, shutting down meetings that had begun during the war in Afghanistan. Defense Secretary Donald Rumsfeld accused Iran of harboring Al Qaeda operatives and sowing theocracy in Iraq. Members of the Bush team spoke to reporters about broadcasting anti-government messages into Iran and funneling aid to Iranian democrats and hinted at rearming the People’s Mujahedin, an Iraq-based Iranian opposition group that American forces had disarmed only a few weeks ago. But, when it comes to Iran’s nuclear program, which could reach fruition within months, the administration’s hard line amounts to this: The White House plans to take Iran to the United Nations. Or, more precisely, to protest Iranian violations of the Nonproliferation Treaty (NPT) at the International Atomic Energy Agency (IAEA), and then hope the IAEA refers the matter to the United Nations, while trying to persuade China and Russia to cut off shipments of nuclear technology to Iran. And, if that doesn’t work, there’s always the broader policy of encouraging a popular uprising in Iran. These strategies have two things in common. First, they rely on actors other than the United States—the United Nations, the Russians, the Iranians themselves—to frustrate Iran’s nuclear ambitions. Second, it’s highly unlikely any of them will work. Credit for alerting the United States to the scope of Iran’s nuclear program belongs to an opposition group, the National Council of Resistance of Iran, which publicized details about Tehran’s nuclear projects last August. The most intriguing detail concerned a hitherto secret uranium-enrichment facility at Natanz, in central Iran. The revelation set off alarm bells in Washington and at the IAEA, since highly enriched uranium can be used to fuel nuclear weapons. The Bush team’s suspicions were further stoked by the fact that nearly 1,000 gas centrifuges, which help enrich uranium, are slated to go online at Natanz over the next 18 months and the fact that China has admitted to supplying the facility with ingredients to produce enriched uranium. Making matters even more suspicious is the fact that the Iranians never bothered telling anyone they were building the plant and, most damning of all, that Iran possesses enormous oil and gas reserves and, hence, has no particular need for such an ambitious nuclear program.Rather than deny the National Council allegations, Tehran conceded the existence of the facility and its intention to begin enriching uranium. In February, it even allowed IAEA chief Mohamed ElBaradei in for a brief visit. The questions, though, extend well beyond Natanz. In just months, another Iranian nuclear facility—a 1,000-megawatt plant built with Russian assistance at Bushehr on the Gulf coast—will become operational.Unlike Natanz, Bushehr isn’t a secret to the United States or to IAEA inspectors. And, unlike Natanz, Bushehr consists of light-water reactors whose spent fuel will be reprocessed into plutonium, not uranium. As a source of weapons-grade material, however, the plant is just as lethal. Indeed, its plutonium could yield more nuclear weapons in a shorter period. 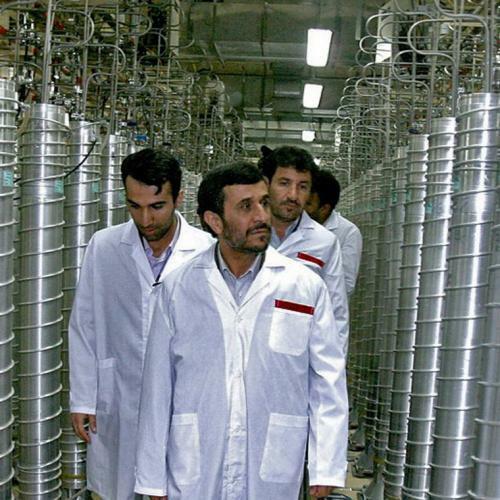 According to a recent analysis by the Washington-based Nonproliferation Policy Education Center, Bushehr could produce between 50 and 75 bombs by 2006; the slower, centrifuge-based process at Natanz could yield only a fraction of that. How does the Bush team intend to respond to all this? First, by relying on the same multilateral institutions it ridiculed during the run-up to war with Iraq. On June 16, ElBaradei will report to the IAEA’s board of governors detailing his findings about Natanz. Defense and State Department officials claim that, while the administration has already begun lobbying the IAEA board to certify that Tehran is in violation of the NPT, the United States will not press for immediate action at the June meeting. Instead, it will begin a campaign to persuade world opinion that the threat from Iran is real. Meanwhile, the Bush team has also begun pressing China and Russia to halt assistance to Tehran’s nuclear program. These efforts are likely to intersect at the next IAEA board meeting in September, when administration officials say they will urge the board to declare that Iran has violated the NPT—a finding that automatically puts the issue before the U.N. Security Council, where the administration hopes to eventually get a resolution condemning, and perhaps even sanctioning, Iran’s violations. On this, the main thrust of the Bush team’s policy toward Iranian nukes, the administration has achieved a rare consensus among its feuding parts. On the question of what happens next, there is less unanimity, partly because the administration has only recently begun to think seriously about the answer. At the same time, many State Department officials, principally at the Bureau of Near East Affairs, have long championed a rapprochement with Tehran’s mullahs and have proposed offering them diplomatic carrots, perhaps in return for an Iranian pledge to allow for more intrusive IAEA inspections. Yet Iran could eject those inspectors on short notice, and, in any case, the White House has enshrined the Pentagon’s preference for “regime change” in official policy. Last July, President Bush publicly committed the United States to helping the Iranian people liberate themselves from the regime that oppresses them, and the administration is now debating funneling overt and covert aid to Iran’s opposition movements. According to this line of reasoning, the problem lies not so much with Iran’s fledgling atomic arsenal as with the mullahs who preside over it, and the surest way to put an end to that arsenal is to put an end to their reign. This calculation directly influences the question of what to do about Iran’s nuclear program; for even Pentagon officials fear doing anything—including a military strike—that would infuriate the country’s popular opposition. UNFORTUNATELY, NEITHER THE IAEA strategy nor the democratic revolution strategy is likely to prevent Tehran from developing nuclear weapons. To begin with, chances are slim that El Baradei, who only months ago was exchanging insults with the Bush administration, will supply Washington with any evidence that supports its position. “It will be very tricky to get the IAEA to do anything,” says David Albright, president of the Institute for Science and International Security, “particularly since the U.S. and El Baradei are at war with one another” over Iraq. And, in the unlikely event that El Baradei does present a damning case, this hardly guarantees the acquiescence of the IAEA board, whose members include countries actively involved in building up Iran’s nuclear capabilities, such as Russia and China. Should the matter progress to the Security Council, there is no reason to believe the administration will fare any better there than it did during the Iraq debate. France, Germany, and other European nations have invested heavily in Iran and enjoy much closer political relations with Tehran than they did with Baghdad. Indeed, the European Union, whose bilateral trade with Iran totaled $12 billion in 2000, is in the midst of negotiating a comprehensive trade accord with the Islamic republic. “The Europeans have been promoting a policy of engagement with Iran for years,” says Ray Takeyh, an Iran expert at National Defense University, “and it’s unlikely they would do anything to disrupt it any time soon.” This time, American officials say, even the British have no intention of following Washington’s lead. As for China and Russia, as two of Iran’s main suppliers of nuclear technology, they have no incentive to back a plan hatched in Washington and numerous reasons to oppose it. Indeed, when an American delegation visited Moscow in February to press for a halt to nuclear aid to Iran, Russian officials flatly declined the request. “Iran has no plans to produce nuclear military projects,” Russian Foreign Minister Igor Ivanov announced on a recent visit to Tehran. “This is a fundamental truth.” The fundamental truth, however, is that its assistance to Tehran has already earned the cash-starved Russian government billions of dollars. And, even if Moscow staunches the flow of nuclear material, Pentagon intelligence estimates have concluded that Iran could produce its own bomb, as the Iranian government has been mining natural uranium for years and conceded in February that it intends to use the substance for the production of homegrown nuclear fuel. TO BE SURE, regime change in Iran is a necessary precondition for security and human rights in the Middle East. But, so long as Iran possesses a nuclear arsenal, regime change is hardly sufficient. The half-life of atomic isotopes, after all, last considerably longer than the half-life of most governments. Consider Pakistan, which developed nuclear weapons as a democracy and has kept them as a dictatorship—or, for that matter, Iran, whose nuclear ambitions began during the Shah's reign. And, whether mullahs or reformers have their fingers on the button of Iran's nuclear arsenal, Iran's neighbors could well respond in kind—probably by building their own arsenals (see Michael Levi, “Royal Pain,” June 2). Nor, as nuclear expert Henry Sokolski points out, does the policy take into account the possibility of third parties acquiring nuclear material from Iran or the other dangers inherent in the mere fact of an Iranian bomb. For years, Washington has pinned its hopes on Iranian reform arriving before an Iranian nuclear program. But that hasn't happened. For years, Washington has also counted on the international community to police Iran's nuclear aims. That hasn't happened either. And, yet, the White House continues to pretend that we can rely on foreign powers and internal reform to stop Iran's nuclear ambitions. But either the United States will put a halt to those ambitions, or no one will. Lawrence F. Kaplan is a contributing editor for The New Republic. This article appeared in the June 8, 2003, issue of the magazine.